Through rare historical and contemporary footage and interviews with more than 160 doctors, attorneys, educators, survivors and experts on the mental health industry and its abuses, this riveting documentary blazes the bright light of truth on the brutal pseudoscience and the multi-billion dollar fraud that is psychiatry. The DVD companion brochure contains over 150 photos and graphics that track the history of psychiatry from it's macabre 18th century origins to today, where 100,000 patients die each year in psychiatric institutions and 20 million children have been put on potentially lethal, mind-altering drugs. 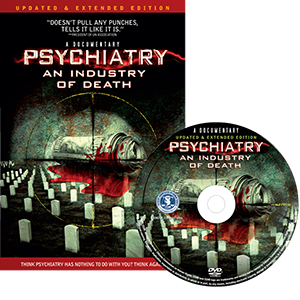 Order Psychiatry: An Industry of Death documentary and companion brochure. Distribute it to others - associates, family and friends. Warn them about psychiatry’s damaging treatments. When you watch the DVD you will be outraged and will want to act to end these abuses.